The indoor air quality in our homes is becoming more relevant in modern times as the use of chemical in the construction of our homes and household products increases. Many experts are of the opinion that the air pollution in our homes are even more serious than that of the outdoor. Here is a list of the most indoor pollutants that you may find in your homes. If you are smoking in the house, you are not only affecting your own health but that of your family members as well. A study showed that the smoke from these cigarettes is harmful to living beings and is cancerous. Hence, ensure that smoking is strictly prohibited in the house or building. If it is unavoidable, make sure that a powerful ventilation system is installed to discharge as much as possible the smoke from the building. Organic chemicals are present in paints, detergents, varnishes and disinfecting products. These chemicals are released when they are used and it is always a good idea to read the instructions of the manufacturers on the use as well as the storage of these products. Tight sealing of the products in containers when not in use will ensure that the leak is minimal. Better still, keep the products in a location outside of the house. Asbestos is one of the earliest building materials that was used in buildings until it was phased out a few decades ago. Today, many of the old buildings and houses may have used asbestos in floor tiles, ceiling boards and insulation materials. The fibers that accumulated in the body from asbestos can cause lung cancer and other diseases when inhaled. Hence, if you suspect that the house you are staying contains asbestos material, get an expert to remove and replace them. Formaldehyde is used in pressed wood products which may be used in flooring, shelving, paneling, cabinets and other furniture. It is also found in fuel-burning appliances. It has a strong smell and is flammable but colorless. The repeated exposure to this chemical can cause various type of cancer. Gas stoves, wood stoves and unvented gas fireplaces are possible sources of pollutants such as nitrogen dioxide, sulfur dioxide and carbon monoxide. Good ventilation and proper maintenance of these equipment are necessary to ensure that these gaseous are discharged from the indoor. CO or Carbon Monoxide is poisonous and is produced by the incomplete combustion of gas or oil-fired equipment. CO will cause the lack of oxygen in the blood stream by combining itself with the hemoglobin in our blood. This will deprive the cells and organs from getting the necessary oxygen to function properly. Added to the danger is that this gas is odorless and colorless. Hence you will not be able to detect it unless you have a proper testing device that is able to measure the ppm of carbon monoxide. This gas is also emitted when you start your car that is operated using fuel. Make sure you do not let the engine running in an enclosed area. Proper ventilation should be considered when you design your car garage. In many underground car parks, CO sensors are placed that detect the amount of CO that is present. A CO concentration of 13,000ppm can cause death within 3 minutes. NO2 or Nitrogen Dioxide causes irritation to our respiratory tract. SO2 or Sulfur Dioxide also causes irritation to our eyes, nose and respiratory tract. Good ventilation and regular maintenance of the equipment are necessary to ensure your homes are safe from these gaseous. If you suspect that your house has these gaseous, you can purchase a indoor air quality monitor that has sensors to detect these gaseous. The other alternative is to get the technicians to come over and inspect the place for you. Dust mites and molds are sources of biological contaminants that are airborne. These contaminants can cause irritation and allergy to our human bodies. Carpets and bedding are often the breeding ground for dust mites. If possible, get mattresses that are conditioned to prevent the dust mites from breeding. Also, get a good HEPA filters to trap and remove these contaminants from the air. Molds thrive in humid environment. Getting a dehumifier is a good way to ensure that the furnitures and walls are dry hence preventing the molds from growing. Ventilating your house ensures that clean air from outside the house is brought into the house to replace the indoor stale air. Natural ventilation is done by opening the windows and doors for the draft to come in. If this is not possible, get a mechanical ventilating equipment such as exhaust fan system. In this way, stale air is removed from the house and fresh conditioned air is introduced into the house. Mechanical Filters can be used to remove contaminants from the air. 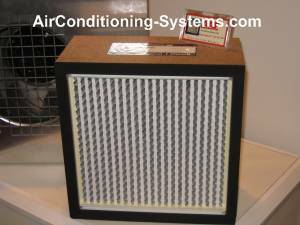 The most effective air filter is known as HEPA filter that can remove more than 99.97% of contaminants having a minimum size of 0.3um from the air. Mold, bacteria, pollen, dust mites and other allergens can be removed using these filters. Honeywell produces many of such filtering equipment. Other filters include pocket filters, cube filters, pleated filters and fiberglass throwaway filters. Ionizers are used to increase the number of ions in the air. Ions help to reduce the contaminants in the air by causing the contaminants to bond to each other. As the size of these particles increases, they will drop to the ground or collected by the ionizers. There are standalone ionizers that you can purchase from any electrical store. Many ductless split air conditioners also offer ionizer feature in their products to enhance the quality of air in the room. 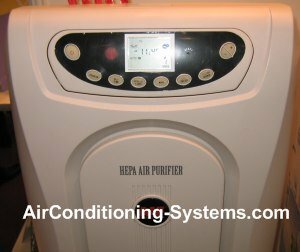 Humidifiers are used to maintain a comfortable humidity in the room during winter. Having a Relative Humidity of 40%-60% is comfortable to our human bodies. Dehumidifiers are used to remove the air moisture from the room and is the opposite of humidifiers. They are needed if your house is humid which makes it a good place for molds to grow. Get a good dehumidifier that retain a Relative Humidity of about 50%. Running the air conditioner during summer usually will dehumidify the place.